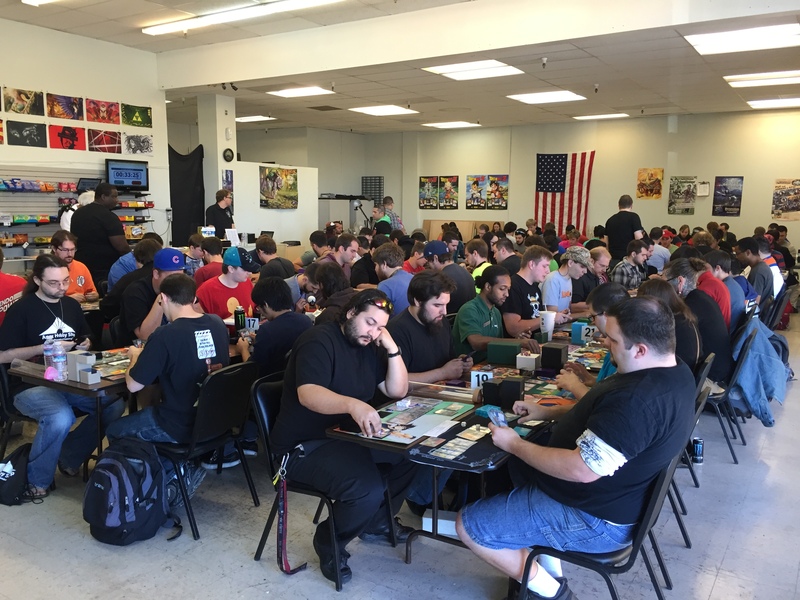 90 players have arrived for the California regional at Forgotten Path Games in sunny Vacaville. You can follow the action on the Dragon Ball Radio stream here http://www.twitch.tv/dragonballradio and we’ll be updating this post as the day goes on. 7 players remain undefeated after four rounds – Steven Pehl (Orange Krillin), Will Houser (Black Krillin), Christopher Huber (Black Krillin), Jarrett McBride (Black Krillin), Dustin Collins (Black Ginyu), Jonathan Browe (Orange Krillin) and Eric Ruth (Red Garlic). Stay tuned to see if any of these players can finish seven rounds with a perfect record. After seven grueling rounds, the following players and decks have made it to the top 16. Jarrett McBride and Douglas Perdomo both qualify for Worlds and will battle out a mirror match to see who is the California Regional champion. Jarrett wins in three games; congratulations to both qualifiers and goodnight from California!